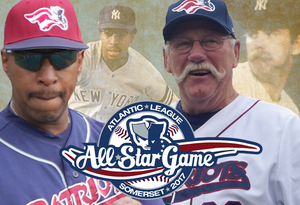 (Bridgewater, N.J., June 11, 2017) – The Somerset Patriots and the Atlantic League of Professional Baseball have announced that New York Yankees greats Sparky Lyle and Willie Randolph have been named Honorary Managers of the 2017 Atlantic League All-Star Game. The 2017 Atlantic League All-Star Game, presented by RWJBarnabas Health and Horizon Blue Cross Blue Shield of New Jersey, will take place at TD Bank Ballpark on Wednesday, July 12th. Lyle and Randolph will reunite at the premier event of the summer in celebration of the 40th Anniversary of their 1977 World Series Championship with the New York Yankees. Both will participate in the pre-game All-Star activities down on the field and other VIP experiences surrounding the All-Star Game. Lyle had a 16-year Major League career and made a name for himself while in New York, winning the 1977 Cy Young Award and back-to-back World Series Championships (1977 and 1978). He was the first American League relief pitcher to earn the award and ranked among career saves leaders at the time he stopped playing in 1982. In 1998, he became the manager of the Somerset Patriots, where he spent 15 years in the role. As manager, Lyle guided the team to five Atlantic League Championships (2001, 2003, 2005, 2008, and 2009) and 1,025 wins. He was named Atlantic League Manager of the Year three times (1999, 2003, 2009) and also won 12 Half Championships and eight Division Titles. He became the team’s Manager Emeritus after the 2012 season. Lyle is no stranger to All-Star Games, having appeared in three as a player in the majors and managed four Atlantic League events. Randolph had a 18-year Major League Baseball career, most notably in the Bronx from 1976-1988, where he was part of back-to-back World Series Championship teams in 1977 and 1978. At the end of his playing career, Randolph ranked fifth in Major League history for games played at second base. He moved into a very successful coaching career with the Yankees, where he served for 11 seasons and was part of the team’s four World Series wins from 1996-2000. He was named the manager of the New York Mets in 2005 and served in the role until 2008. During that time, Randolph brought the Mets to the National League East Division Title and one game from the World Series in 2006. The six-time Major League All-Star has been a part of the Somerset Patriots family for many years, attending special events and welcoming the players at Spring Training. The Somerset Patriots will be announcing special VIP opportunities for fans to meet both Lyle and Randolph at the event in the coming days. The 2017 Atlantic League All-Star Game is the premiere event of the summer, hosted by the Somerset Patriots at TD Bank Ballpark on Wednesday, July 12th. The event is presented by RWJBarnabas Health and Horizon Blue Cross Blue Shield of New Jersey and will feature the biggest Fireworks Show in ballpark history, commemorative giveaways for all ages, entertainment, and a Home Run Derby. For tickets, stop by the ballpark, call (908) 252-0700 or visit www.somersetpatriots.com.